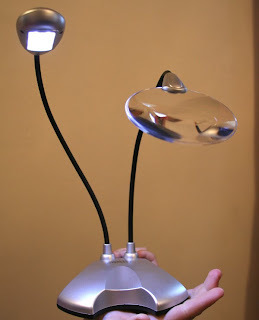 You know how you see a cute project idea somewhere and say to yourself, "What a cute project, I'm going to make that!"? 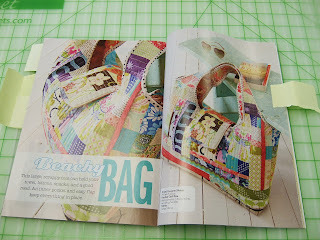 Well, that's what happened when we saw this quilted beach bag in the latest issue of Fresh Quilts. We (Hether, Jo, Joy & Jessica) gathered our supplies and scheduled a few sessions to work on it. 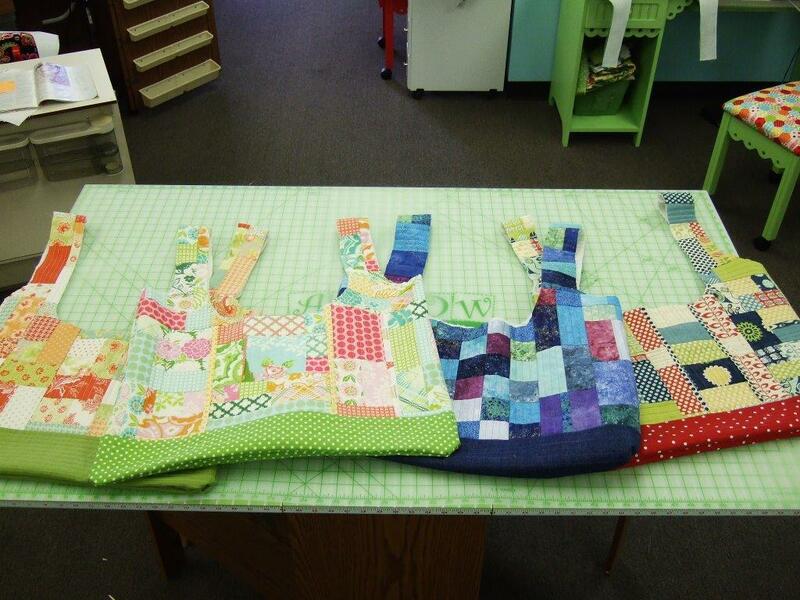 The first thing we had to tackle was cutting the fabric - and there was a lot to cut! 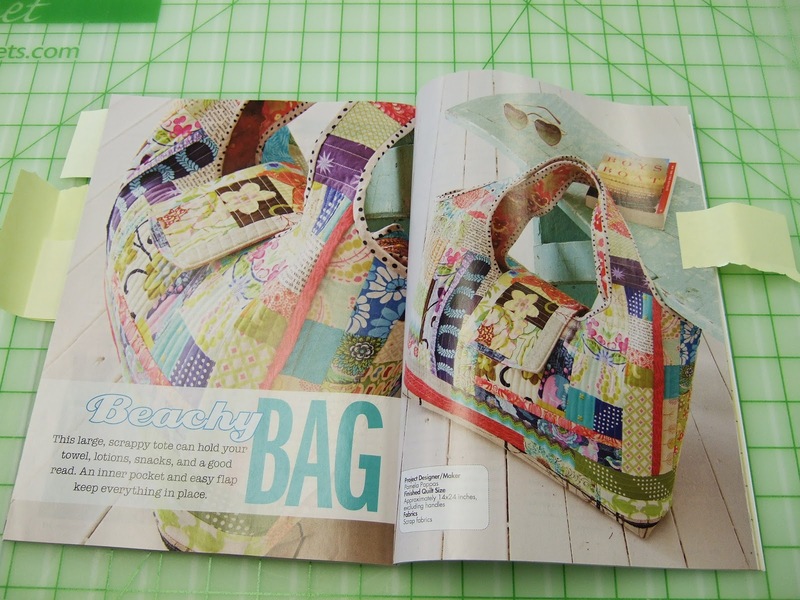 Then we had to piece it all together on the batting that was cut to the shape of the bag to make our patchwork "fabric" for the bag. Lots of sewing (and yes, some swearing at this point)! Voila! Our bags are complete! 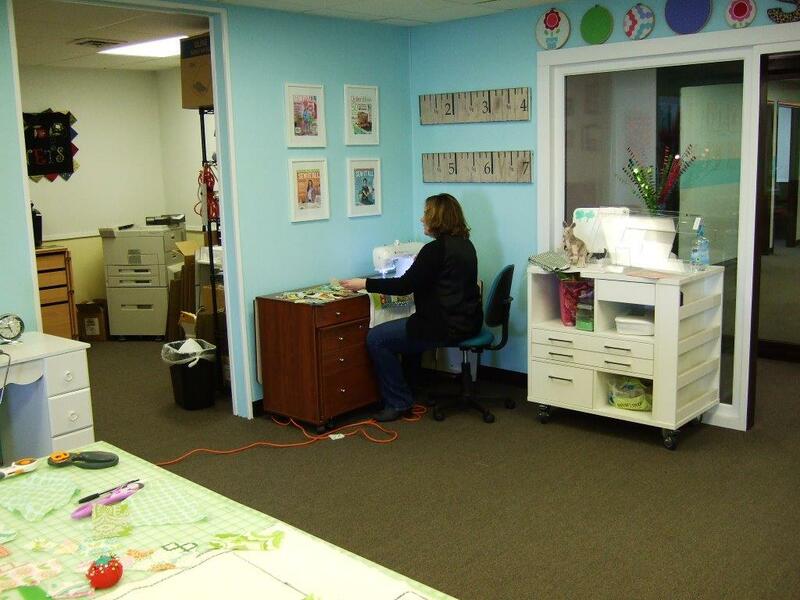 We love that this project challenged all of us in different ways and allowed us to use our cabinets in the freearm position to access our freearm on the machine and in flatbed position with the insert to create straighter-ish stitches. With all the cutting and ironing our cutting tables also got a work out! 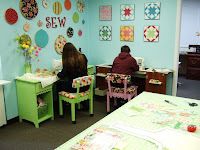 The project taught quilting, binding, the importance of ironing for sewing and following a pattern and also when not to. 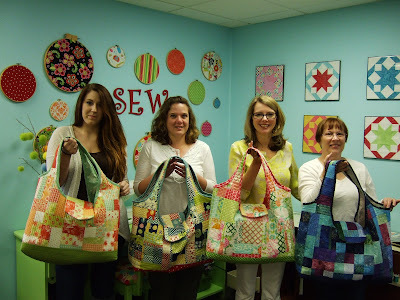 Joy’s thoughts (red and blue bag 2nd from left): During this project I learned how important it is to sew fabric all the way to the edge or beyond. It is hard to fix it after. I learned that clips can be used during the binding process rather than pins. Pins poke. 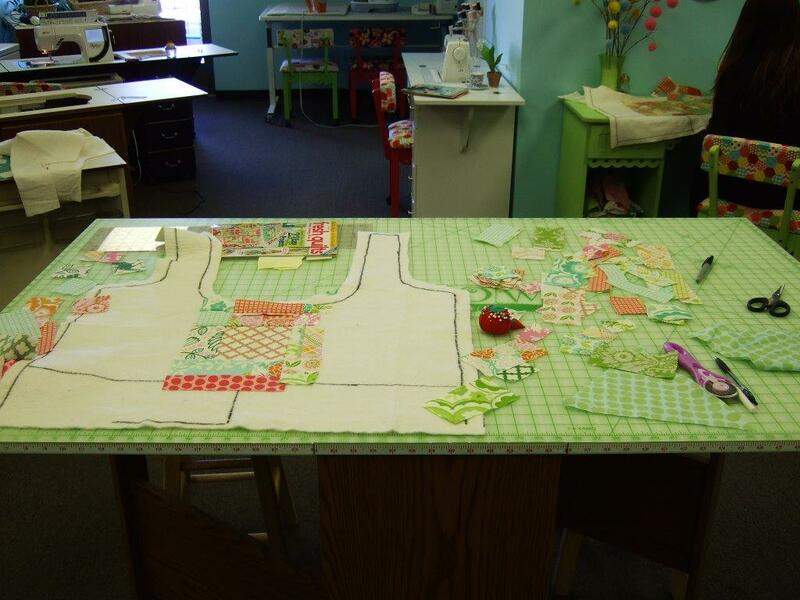 On this pattern when using scraps to quilt there was no pattern you needed to follow. No wrong or right way to piece them. Quilting takes patience. Hether’s thoughts (lime and pink bag third from left): This was the first project we did that I learned a lot of new techniques. My two new favorite things are my ¼” foot and a quilt guide on my machine. I will always use them. I also learned in a group project it is best to be the one lagging behind as I learned from all their mistakes, one of which was using the pattern to cut the fabric, the reverse side needed to be flipped over to match perfectly. Ooops! I would also make sure you have lots and lots of thread on hand! Quilting uses a ton and we had to run to the store twice. Jo’s thoughts (blue bag and 4th on from left - Jo is our expert quilter and the teacher to us sewing novices): My most enjoyable part of making the beach bag was watching how the straight line quilting enhanced the random fabrics in the bag. I used a variegated burgundy thread that showed against the lightest fabrics and disappeared on the purple batiks. Using the free arm of the cabinet made it easier to sew the binding around the arm holes and top opening. One thing that we all found was important was having some good lighting! We happen to have an extra Might Bright Light on hand, so we're going to give one away to a lucky winner! Just leave a comment here on the blog by Sunday, June 21st at 11 pm EDT. And if you have any questions about the project, feel free to leave those in the comment section as well. We hope you enjoyed our Show N' Tell! Did any of you use precuts? And Did you find it difficult placing the fabric pieces randomly? Love all the bags and want to make one myself. Hi Jodi- We did buy fat quarters and cut them up into mainly 2.5" rectangles and 2" squares to make it easier on us and to match. The magazine recommends using your scrap pile, but there would be a lot of cutting in our opinion. They all turned out so cute. Great job all of you , and thanks for sharing. I like the premise of this bag. Kind of similar to fuss-cutting. A fun show and tell!! Thank you. Great job, and fun reading what you learned! They all look great! I love making bags! You all did a great job! I'm inspired to make my bag project that has been hanging fire for a year! Thanks for sharing your ideas & great comments. I would love a Might Bright Lamp, great for sitting & sewing bindings on quilts at night as well as taking to class or on retreats. I think all the bags look so great! Miss Blue is Here, And You Could Win One!